Learn how to turn squares and rectangles into circles and ovals with no curved piecing—it’s easy! Use innovative layering, playful patterns, and delightful color choices to create 11 mind-bending quilt projects that’ll have you seeing double. The best-selling author of Strips ‘n Curves shares three simple construction methods. 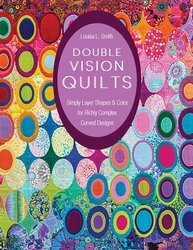 With something for every type of quilter, the endless possibilities of this collection will inspire you to see quilting in a whole new light.